Tango dancers María Nieves Rego and Juan Carlos Copes met as teenagers nearly seventy years ago, when their magnetic chemistry made them one of tango’s most beloved duos. They would continue to dance, love and hate together for decades. Our Last Tango reveals a fiery love story that burned hot both on the dance floor and off. Interspersed with Maria’s candid interviews, gorgeous dance sequences convey the intimacy and tension of her story and of the dance itself. Director German Kral, a one-time pupil of Wim Wenders, instills in his film a true reverence for the art of dance and its most devoted artists. 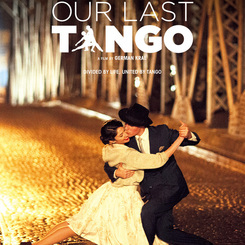 Our Last Tango captures the true beauty and heartbreak of love and history’s most passionate dance.